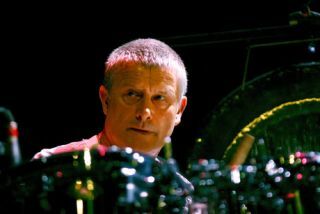 Andrew Cross's film The Solo represents a new chapter in the life of master drummer Carl Palmer, who continues to push creative boundaries with his playing. For Cross, it answers his simple question - 'Whatever happened to the original drum solo guy?'. Cross's artistic brief was simple, the player had to be prog, and British, and able to turn the drum solo into an art form. There was really only one choice. "I've never been interested in making an instruction DVD," says Palmer. "But the idea of the solo as an art piece really appealed to me, and I was happy to be involved." "It's the antitheses of the music video," Cross continues. "All the elements are stripped away except the solo, which is filmed in individual sections, and edited into a final split-screen art work." Palmer adds: "For me, it's a way of interesting non-drummers, with a different way of looking at playing." There is no doubt that the film stands alone as an art piece, as well as showcasing the work of a musician who is still at the top of his creative and technical skills. "When I originally composed the solos, I ended up with the snare solo, but we decided to put it at the beginning, and build everything else around it. By the end, the split screen has one camera on my bass pedal, and the other on the top of the kit." "We shot with five separate cameras, and edited the film over a year," reveals Cross. "And Carl was involved with the production right through from start to finish." "It's not a concert," Palmer continues. "It is a piece of art and I am really proud of it. It's something unique. We filmed it during the summer break in a lecture theatre at Southampton University where Andrew lectures. Hopefully people who like art will enjoy it, as well as people who love drums." The Solo is showing Thursday - Sunday from 1 - 5 p.m until 25 July at the Ikon Eastside Gallery, Birmingham. Admission is free. A limited edition 12" vinyl record is available with photo inserts signed by both artists. Only 200 copies have been pressed, and the cost is £200. A 35-minute DVD of The Solo is also available priced £15.